You may be familiar with this dish or you may not. Truth be told, I didn't know about these until I saw the recipe in the Taste of Home Cookbook. After looking at the picture and reading through the recipe, I just knew that this would one be a hit in my house....and it was. 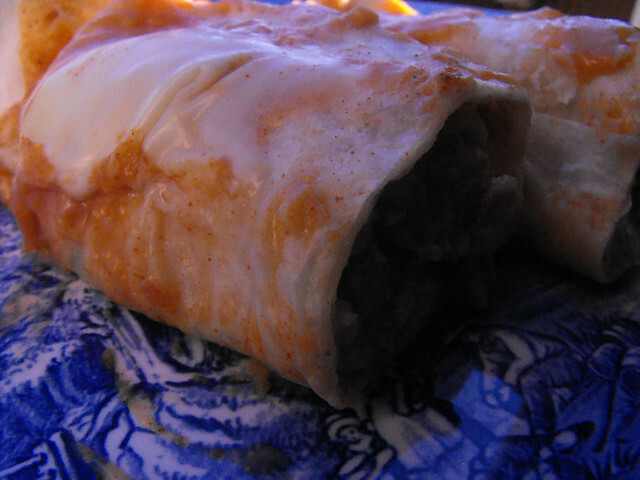 It is SO good, it's a cross between a taco and a burrito, it's creamy, it's filling, it's delicious. * In a large saucepan, melt butter. Stir in flour until smooth; gradually add water. Bring to a boil; cook and stir for 1 minute or until thickened. Stir in chili powder and garlic salt. Bring to a boil. Reduce heat; simmer, uncovered, for 10 minutes. 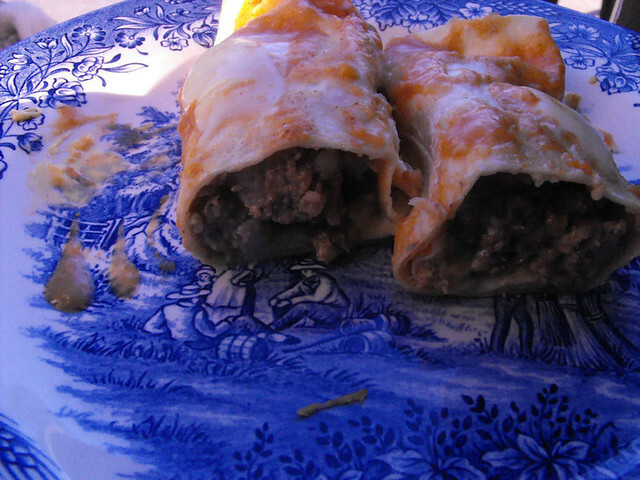 * In a large skillet over medium heat, cook the beef, sausage and onion until meat is no longer pink; drain. Stir in refried beans; heat through. * Spread 1/4 cup sauce in a greased 13-in. x 9-in. baking dish. 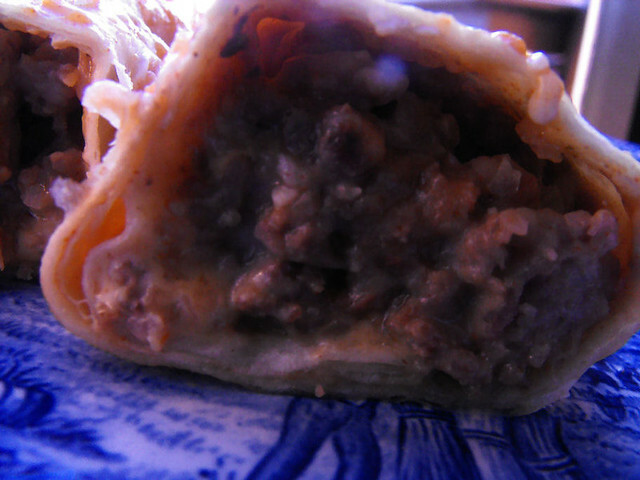 Spread 1 tablespoon sauce over each tortilla; place 2/3 cup meat mixture down the center of each. Top each with 1/4 cup cheese. 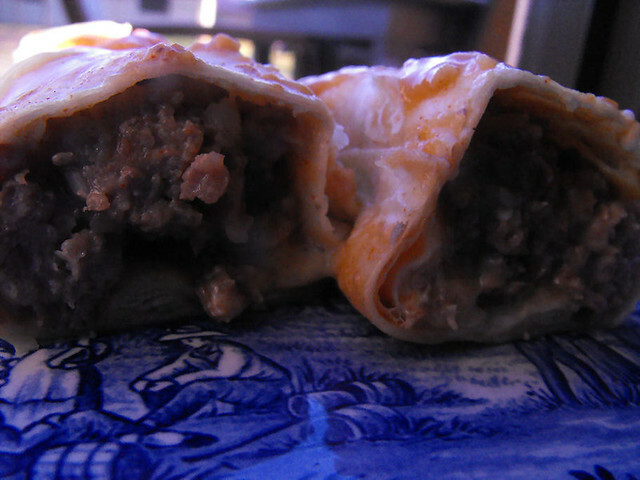 Roll up and place seam side down in prepared dish. Pour remaining sauce over the top; sprinkle with remaining cheese. * Bake, uncovered, at 350° for 18-22 minutes or until bubbly and cheese is melted. Serve with optional toppings if desired. Yield: 8 servings. My family would like this too. I'll have to try it. This looks really good! I'm going to put it on the menu for this week! oh my gosh! Those look scrumptious! Going to try them this week! I'm a long time silent fan lol I've been reading and cooking/baking but haven't posted until now! I love your recipes and have shared your blog with many of my friends! I had a question about this recipe. Are the amounts for the butter, flour and water correct? I could never get it to thicken for me. I ended up using a water/cornstarch combo to make it thicken even just a little bit. Did I somehow do something wrong?